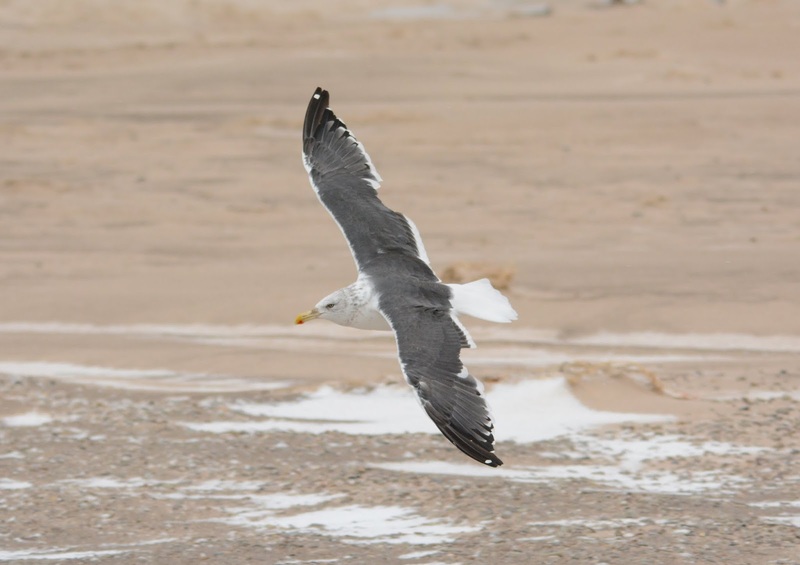 I had completely taken the presumed Chandeleur Gull (Herring x Kelp hybrid) that spends its winters between Berrien County, Michigan and LaPorte County, Indiana, off my radar for the season. Having last seen it on Thanksgiving Day 2014, I was very happy to happen upon it on Sunday while gull-watching from the pier at the harbor mouth in Michigan City. Putative Herring x Kelp ("Chandeleur Gull"). Michigan City, IN. 22 March 2015. The bulbous-tipped bill is seen well here as is the thickness to the whiter trailing edge on the outer secondaries. Michigan City, IN. 27 November 2014. Note that the outer greater primary coverts still show black streaks, despite this bird showing an otherwise definitive adult plumage (as was the case in October 2013). I think it's safe to say that the small white mirror on p10 is a direct influence from its Kelp ancestry, as is the extensive black on both webs of p8-p10. I can't think of any other instance that I've observed an adult gull with black subterminal marks all the way down to the first primary. Note the apparent thickness of the trailing edge to the secondaries, and much more interesting, the wide white tips to the inner primaries. It is known that adult Slaty-backeds show these deep white tips to the inner primaries (deeper than what is seen here), but an extensive photo study online has taught me an excellent lesson: adult Kelp Gulls can show very broad trailing edges as well as thick white tips to the inner primaries (see here for an extreme example). This is a bit different on presumed hybrids with Great Black-backed influence. Yellow-green leg color with grayish tones points away from two pink-legged parents (i.e., Herring x GBBG). Flesh-colored feet is something I've regularly noted on yellow-legged adults (such as Yellow-footed Gull, Lesser Black-backed and Ring-billeds). Shows a somewhat broad secondary skirt and relatively long legs. I will reiterate my conviction that Chandeleur Gulls are a "legitimate" hybrid form. I don't find it difficult to believe that Kelp Gulls, which are generally expanding north, and Herring Gulls, which are generally expanding south, have converged again in small numbers somewhere in the Gulf Coast/Caribbean. You can read more of my thoughts on this here.